string(1356) "Resource Centre > Uncategorized > Ending Exploitation. Ensuring that Businesses do not Contribute to Trafficking in Human Beings: Duties of States and the Private Sector"
This Occasional Paper, the seventh in a series of Occasional Papers published by OSCE Office of the Special Representative and Co-ordinator for Combating Trafficking in Human Beings, outlines the measures that businesses can take to ensure that trafficking in human beings does not occur in their workplaces or those of their suppliers (i.e., other businesses that sell products or services to them). 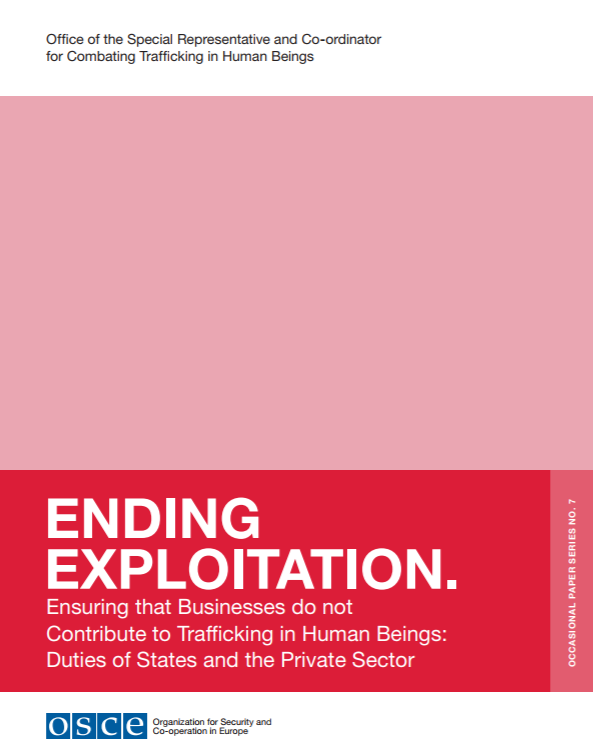 It also reviews the obligations of the OSCE’s participating States to regulate business activities and to enable businesses to take appropriate action to stop human trafficking from occurring. It provides a series of recommendations for OSCE participating States.